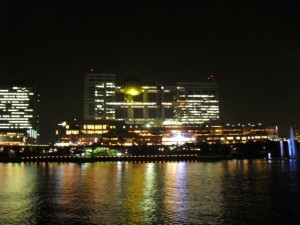 It’s totally different looks Tokyo Bay’s day cruise and night cruise. 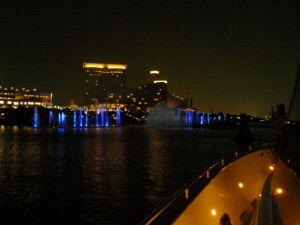 The picture is light with sea fountain show. It’s great Tokyo nigh scene. The custom sports fisher, Jim Smith, is in the Shipyard and doing hull paint. The finish is just breathtaking!! 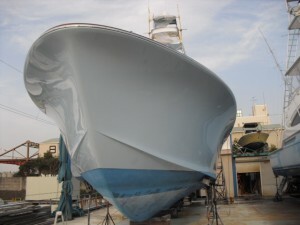 Painter’s skill is obvious when I see hull reflection and great choice of paint manufacture. When she is on the bottom paint and water line, I will update the photo. 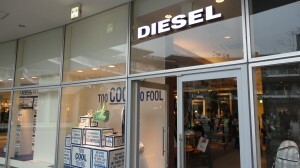 I love this brand “Diesel”. The jeans I have are wearing long time and very stylish and comfort to wear. The shop display said “Too Cool To Fool”. 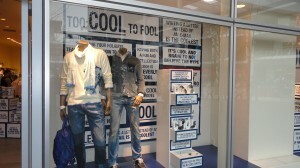 The display is limited space, but it shows brand concept with unique phase and graphic. It’s simple but very eye catchy. 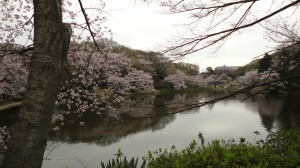 The park called Mituike Park in Yokohama is famous for cherry blossom. There are about 1000 cherry tree. I don’t know why it’s so good to eat outside. This Picture appears at my company’s entry flash site. The picture meant to be my company’s background. 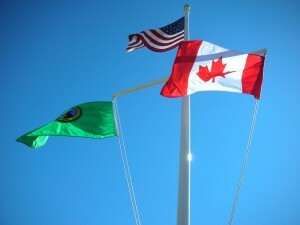 The green flag on left side is Washington state flag where I used to live and the right side is obviously Canadian flag. I went to Vancouver, B.C very often by using I-5. At that time, US dollar was stronger, so I went to there to meet friend, restaurant and shopping. It takes about 3 hours drive from Seattle. Canada is using metric same as Japan, so when I enter Canada, the speed limit displays like 80km. I have to see very small letter on my car’s metric speed monitor. 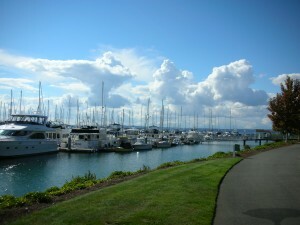 When I was in Seattle, I worked for the Custom Yacht Interior Design firm near by this kind marina. It was very nice neighborhood and that experience has been very good resource what I’m doing.